The HomePlow Basic is an 18" tall economical plow for the person that wants to move snow quicker than other snow removal methods. The up/down motion of the moldboard is adjusted manually. The right/left motion of the plow is controlled by the HomePlow's patented Auto-Angling™ system. Requires assembly with common tools. Perfect for a homeowner with a long driveway! 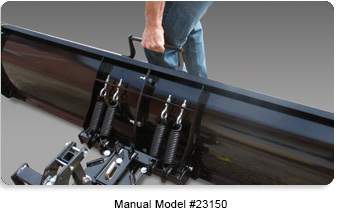 Assembly and plowing is easy with this Meyer 23510 80" HomePlow. Assembly takes less than an hour, and mounting takes less than a minute with Quick-Link technology allowing you to slide this snow plow into a class 3, 2 inch hitch with no tools needed. And, auto-angling technology uses the weight of the snow to angle the blade to the right or to the left, without a power supply. Front Hitch Mount Kit NOT INCLUDED (Sold Separately). Weight of the snow angles the blade to the left or right without any power supplied. Manually lift the plow to start your job. Locate the edge of the blade when plowing with helpful plow markers. Mount to a Class 3, 2 inch hitch in minutes with no tools needed. Plowing is a breeze with this 80" plow that’s designed out of durable steel and coated with Dura slick™ paint for better snow plowing action.